The last time that I wrote we were in Puerto Escondido and headed north to points unknown. Well, we didn't make it too far north as we pulled unto Isla Coronados and we've been here ever since. As Sue said, this place reminded her of Light House Reef in Belize as it has beautiful anchorages and lots of places to dive. There are 3 anchorages here and we're in the W anchorage as shown in this photo that I took the last time that we were here. This anchorage has beautiful beaches and has good protection from the SW to the N. You can also move around the hook and anchor on the S side or continue to the E side, but these other anchorages are nowhere as popular as the W anchorage. The N and E sides of the island are marked in the cruising guides as diving locations and I've been diving daily and exploring the area. Compared to many Caribbean locations, the diving here is just OK. I really miss the colorful corals and sponges of the Caribbean, but you often get to see large fish. The visibility is also highly variable and you can get some very cold upwellings. Yesterday I had water temps in the 50s when I was below 40', but the surface temp is now in the mid 70s, which makes snorkeling very nice. See the "For the diver" section for more info on diving locations. On the NE side of the island there's a sea lion colony and on several occasions I snorkeled around them. The big bulls weren't exactly happy that I was there, but the didn't charge. The younger pups were very curious and would swim all around and under me trying to figure out what type of creature I was. That was a lot of fun. 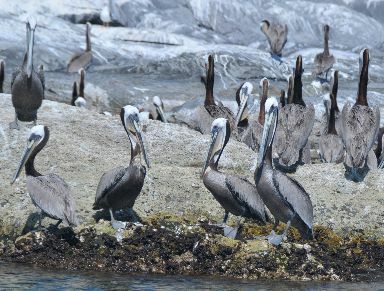 There are also huge colonies of pelicans all over the island. I had never realized how well camouflaged they are until you look at then sitting on guano covered rocks and realize that their feather color matches the rocks and their white heads match the guano. The winds have been very light, which made the multi-mile trips to the N/E sides of the island very enjoyable in the dinghy. After one of our combined diving/snorkeling trips, Gordon from s/v Far Country noted that there was a whale feeding nearby. We took the dinghy to the area and we were delighted when the 30' whale surfaced right next to the dinghy. For about 20 minutes we followed the whale and got to experience whale breath (can you say fishy? ), whale poop and even whale farts. We could only see the whale's back and dorsal fin, so identification was difficult, but based upon the dorsal fin we guessed that it was a small fin whale. 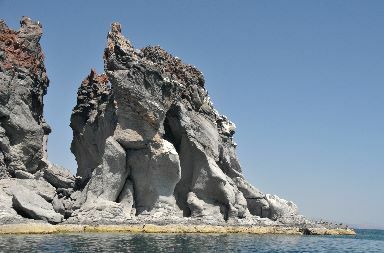 One of the things that I really like about Isla Coronados is the stone formations on the N and E sides of the island. These are wind worn sculptures of gray and are just beautiful with narrow towers of rock. Despite all of these other wonderful things, the thing that impressed me most wass the phosphorescence of the water in the anchorage. At night the water just sparkles with glowing organisms. The line attaching the dinghy to the boat glowed like a sourcer's wand and if there was enough wind to create small waves, the crests would glow as they moved across the water's surface. We have a bow mounted anchor light which attracts fish at night and I had a hard time believing how many fish were congregating under the light. When you looked down, the water was filled with the glowing shapes of fish as they swam around hunting other fish. When a fish would chase another you'd see a sudden flash of light and you'd wonder what the outcome was. It was also cool to watch pods of dolphins hunting in the anchorage and observing it as a line of light in the water. One night when sitting on the bow and enjoying the spectacle, we heard what sounded like distant fireworks. As it turned out, we were listening to whales slapping their tails. Along with the natural beauty, we also had a great time meeting new boats and hanging out with them. 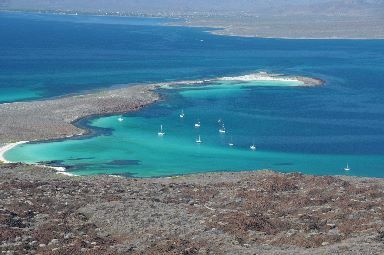 One day a group of 9 of us took s/v Oya into Loreto where we shopped, got Internet and had a great lunch. We also played beach bocce and had happy hour get-togethers. It was wonderful. But, as so often happens as a cruiser, we had to also say goodbye to Gordon and Valasta from s/v Far Country. We had cruised on and off with them since meeting them in the boatyard in Guaymas and it was sad to part ways. Now we've ended our northward trek and are starting a slow trip southwards. I guess that one of the nice things about this trip is that we've been through the area and can now spend time at places that we enjoyed and/or fill in other places that we missed before. I dove the point at approx N26-08.1 W111-16.8. The point is is the interesting as it has very large bounders and some nice cracks descending to a sand/gravel base at 60+'. As you move to the NE it rises to 35'. It drops as you head SW, but becomes a a slope of medium boulders. Sue reported that the snorkeling was some of the best that she's seen in the Sea of Cortez. I also dove at N26-08.21 W111-16.29, Large boulders going down to sand/gravel bottom at 42' Lots of large fish. The point at 111-15.9W 26-08.3W wasn't all that deep, but the point continued out quite a distance underwater and there were lots of steep rock formations and cracks. Once again, lots of large fish. 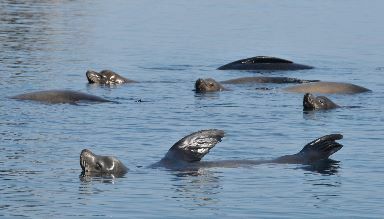 The point known as Piedras Blancas is home to LOTS of pelicans and if you head S there's a sea lion colony. The bay between the point and the lion colony is fairly shallow (~25'), but suprisingly contains a lot of fish. Better snorkeling than diving. in 2011 I also dove the point at approx N26-07.6 W111-15.5 and had a good dive. Nice walls and large boulders. and quite a few fish.